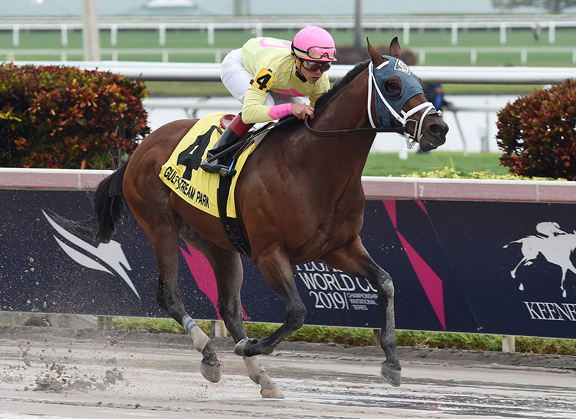 After pondering a trip to Dubai with their star dual-surface sprinter, the connections of World of Trouble (Kantharos) will stay home and contest the GI Carter H. Apr. 6 at Aqueduct, co-owner Michael Dubb confirmed to TDN Thursday. The story was first reported by Daily Racing Form. Announcing himself with a 13 1/2-length romp in the Pasco S. last winter at Tampa Bay Downs, the bay finished third when favored while stretching out in the GII Tampa Bay Derby. Running a strong fourth after contesting a scorching pace in the GII Woody Stephens S., World of Trouble annexed the Quick Call S. and Allied Forces S. when switched to grass and just missed by a neck against eventual champion Stormy Liberal (Stormy Atlantic) in the GI Breeders’ Cup Turf Sprint. He closed out his sophomore campaign with a dominant conquest of the FTBOA Marion County Florida Sire S. back in Oldsmar and captured the washed-off Gulfstream Park Turf Sprint S. last out Jan. 26. Dubb added that after potentially picking up his first first graded stakes victory in the Carter, the Jason Servis trainee could be pointed to a big-money event on GI Belmont S. day, although on which surface is up in the air. A return trip to the Breeders’ Cup remains the year-end goal for World of Trouble, but surface as well as distance will weigh in the decision. While last year’s Breeders’ Cup Turf Sprint was contested over 5 1/2 furlongs on a traditional course, this year’s renewal will return to the downhill course of Santa Anita at 6 1/2 furlongs. World of Trouble has never gone longer than six furlongs on grass. “That’ll factor in, but it’s a long way off, so we’re happy to just take it one race at a time,” Dubb said.